Still he delayed. So the angels seized his hand, and the hands of his wife and his two daughters – in God’s mercy – and brought him out and left him outside the city. As the brimstone and fire then rained out of the heavens onto Sodom and Gomorrah, Lot’s wife looked behind him and became a pillar of salt. I confess, I have always had a certain affection for the woman in the Bible we know only as “Lot’s wife.” Any way you look at it, she got the raw end of a really raw deal. For starters, she was married to a dolt — and even that descriptor is too generous when you look at just how incompetent Lot really was. First, in Genesis 19:8, he offers his two virgin daughters to the men of the town to “do with as you please.” It is only thanks to the intervention of the angels that the young women are saved. Then, in verse 20, when the angels urge Lot to take his family and flee the city before it’s too late, he dilly dallies so long, the angels have to physically take his hand and lead them out of town. Once outside, the angels urge him again to flee, and what does Lot do? He stands his ground and argues with them! “It’s too far!” he complains. “Can’t I just go to that town over there instead!? !” The angels acquiesce again, holding back the brimstone and fire until the family has reached safety. Then, in a final act of irresponsibility, Lot fails to tell his wife and daughters the warning one of the angels had given him in verse 17 — that crucial piece of information about how, if they look back at the destruction, they too will be swept away. The text states clearly that the angels warned him — “al tavit achareycha” — in the masculine singular. These crucial words of warning were only spoken to Lot, not to the rest of his family. And Lot, being the kind of guy Lot was, never relayed them. We all know how this tragic series of events ends. Lot’s wife looks behind them and turns into a pillar of salt. The question that has been occupying rabbinic commentators ever since is: Why did she look? Some have answered generously. Writing in 12th century Egypt, Maimonides said Lot’s wife was looking behind her husband to see who might be following him, acting as a rear guard for all his household, who were hurrying to be saved. The late 14th century agaddic collection Midrash ha-Gadol says she felt concern for her married daughters, whom they had left behind, and she was turning to see if they were following. Jacob Chinitz, rabbi emeritus of Beth Ami Congregation in Philadelphia, now living in Israel, imagines that she looked back only to delight in the destruction of her townspeople. “She could not resist enjoying their failure and her success even though it was only her good fortune to be married to Abraham’s nephew,” the USCJ explains. Good fortune!?!? Being married to this schlemiel was good fortune!?! To my thinking, the question isn’t why did Lot’s wife look back — it’s why wouldn’t she!? Here she is, the world literally raining down on her in flames, and her future, her fate is entirely dependent on this man who has proven himself paralyzed by indecision. And when he finally does make decisions, they are disastrously bad ones! Lot’s wife may very well have been looking back out of concern for her other daughters, or out of sorrow at the destruction of the people she knew. We can never know because the text doesn’t give a clue about her inner life. But what I do know is that I would have looked back — if for no other reason that to make sure we were on a safe path, that we weren’t being pursued, that flame and fire were not lapping at our heels. I would have not only looked back, I would have looked forwards and sideways too, to check, and recheck, that this course of action was the right one. To make sure my inept husband was not leading us into disaster. When you are tethered, without recourse, to an unfortunate man, you can never be too careful. that turns all shapes to pillars. she could taste the salt. Original artwork by Charles Dickinson. Having found this little chunk of salt in Rachel’s bag, near Genesis 19, while flipping through the pages of my Bible on my way back to find she who is referenced only as “Noah’s wife,” I was reminded of a pillar other than Jacob’s. A pillar made of salt and shaped like a woman. I think of this woman, identified only as “Lot’s wife,” weeping as she turns and sees the destruction of the city that was her home. 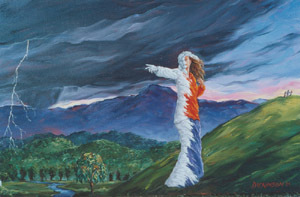 It is preached that because she and her family had been instructed not to look back, God punished her for doing so. But scripture does not say this. Lot’s wife came out with two of her daughters, but her married daughters remained behind with their unbelieving husbands. She may have had sons and grandchildren who also remained. How could she not turn back, hearing their cries in the burning city? Was it all those tears that turned her to salt? For me, that salt pillar is a monument to Shekhinah, and also represents Kwan Yin, the Buddhist god- dess of compassion. Both, hearing the cries of the children, remain spiritually on the earth plane, rather than going on without us. If we have reason to be upset about sexism in the Bible, the failure to provide the name of this woman who forever symbolically stands as a silent pillar of witness to our tears, our Guardian of Grief, is a blatant example. There are many such empty silences in scripture that should resound with the names of women. None is as vacuous as that which should hold the name of the woman to whom Noah was married. The “rear guard” idea is fascinating! Could you give the source in Maimonides? I would love to read more of his thoughts on this passage.